At today's San Francisco event, Intel mostly discussed what we know about the upcoming Westmere processor, but revealed they're scrapping the next dual-core 45nm processors, in favor of 32nm Westmere chips in early 2010. The first Westmere chips will be the dual-core Clarkdale and Annendale processors, for desktop and mobile uses, respectively. In addition to the 32nm CPU, these chips will feature a 45nm integrated graphics and memory controller. Integration in particular was a big point of emphasis for Intel, and said they plan to continue down this path, because it cuts costs in development and production, and also gets products to market faster. A six-core, 32nm processor (codename: Gulftown), is also planned for a future release. Also announced early this morning, and reiterated at today's event, is that Intel scrapped plans for refreshed dual-core 45nm processors, Havendale (desktop) and Auburndale (mobile), in favor of the Clarkdale and Annendale processors, for desktop and mobile uses, respectively. Intel said than an "accelerated product ramp" is allowing them to overlap the newer, smaller dual-core chips with the upcoming pair of 45nm quad-core processors, Lynnfield (desktop) and Clarksfield (mobile, and not to be confused with Clarkdale), which will give end-users options when it comes to CPU performance. These four upcoming chips will run on a new Intel Series 5 chipset, codenamed Kings Creek (shown above) for desktop and Calpella for mobile. Intel showed off these new 32nm processors and chipsets at the event in a very informal demo, just to show that these products work and exist (the mobile platform even ran Spore). It's also interesting to note that normally, most Intel processors are released to the server market first, then go to the consumer PC market for consumption. With the upcoming Westmere processors, Intel will produce the chips for consumer PCs first, marking a departure in strategy for them. While Intel is probably jumping forward to stay ahead of the pack in a slumping economy, what this means for you, the consumer, is that you'll get better performing processors even sooner than expected, which should be early 2010. Feb. 10, 2009 - At a media briefing in San Francisco today, Intel Corporation discussed new milestones for 32nm manufacturing and progress toward future products. Earlier that day, in Washington, DC, Intel President and CEO Paul Otellini disclosed that Intel is making the largest-ever investment in a single process technology in the United States to support upgrades to advanced manufacturing facilities in the country and the move to its next-generation, 32nm chip manufacturing technology. Intel is investing approximately $7 billion in 2009-10 on 32nm manufacturing technology, raising the total by the end of that timeframe to approximately $8 billion (for 32nm investment in the United States). 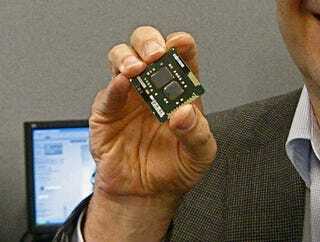 - Intel is demonstrating the first 32nm working microprocessor in both mobile and desktop systems.